Been working on some more Röntgen prints! Wilhelm Röntgen (or Roentgen, without the umlaut), 1845-1923, the German physicist who discovered x-rays, earned the Nobel Prize for physics in 1901. I've depicted him at work, studying this mysterious, newly discovered, invisible form of light, based on a photograph of him in his lab, using a Crookes tube to produce x-rays. 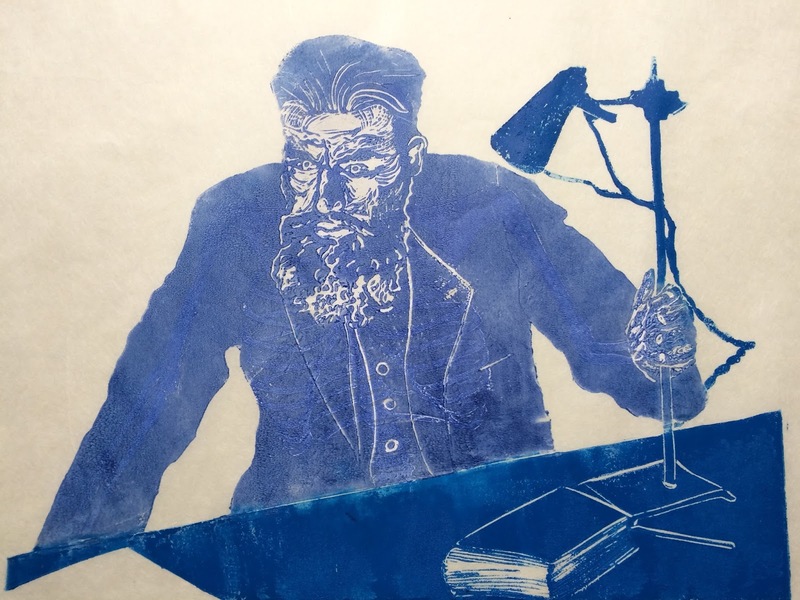 The form of the print mimics the nature of his discovery - much as x-rays reveal the skeleton within, the thermochromic ink in which Wilhelm Röntgen is printed dispears when heated to reveal his skeleton below! Wilhelm Röntgen discovered X-rays using the Crookes tube in 1895. A Crookes tube is an early experimental electrical discharge tube, invented by English physicist William Crookes and others around 1869-1875, in which cathode rays, streams of electrons, were discovered. Despite his efforts to block the light from the tube with cardboard, during his experiments, he noticed that the invisible cathode rays (electrons) caused a fluorescent effect on a small cardboard screen painted with barium platinocyanide when it was placed close to the aluminium window in the tube. Some sort of light was passing through the opaque cardboard and Röntgen speculated that a new kind of ray might be responsible. He called these unknown rays 'x-rays'. We now know that x-rays can be produced when electrons strike a metal target, through a process called Bremsstrahlung (or 'the braking of radiation'). 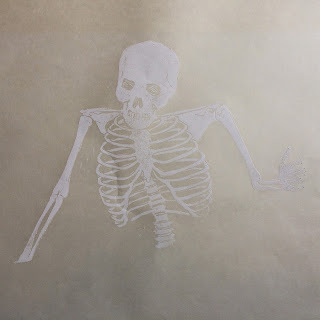 During further tests of the interaction of these rays with metals, he saw the image of his own ghostly skeleton on the barium platinocyanide screen. Within two weeks he had taken the first x-ray photograph: an image of his wife Anna Bertha's hand, inventing the entire field of radiology and medical imaging! Thermochromic ink changes colour with temperature. If you heat the print above about 30°C ( 86 F) Röntgen will go colourless and disappear, to reveal his skeleton. By using, for instance, a hair dryer, it's possible to see Röntgen's skeleton. It's a metaphor for x-rays! Pink Fairy Armadillo - What the Fukunushi?